AKG as a brand has established itself over the years. In fact, the brand offers some amazing headphones at great prices. AKG N60NC headphone is an on-ear headphone with good noise canceling feature. The connectivity via Bluetooth is also amazing. The headphone also has a built-in mic and remote and that makes it different from other headphones in its league. The best part about AKG N60NC headphone is it is compact in size. It’s also comfortable for your long music sessions. The headphone is tad stylish in looks and you can carry it along with you or simply flaunt the headphone in style. The sound performance of AKG N60NC headphone is excellent and this makes the headphone quite popular. The battery life of the headphone is great for the price. If you do not use the active noise-canceling feature, then the battery may last longer. With the noise-canceling mode on, the battery life is less if you compare it with other headphones that are available at a similar price. It integrates with every device to give you an amazing audio quality every time. If you are looking for a decent headphone in your budget, then you can consider AKG N60NC headphone, it will not really disappoint. Who is it for and should you buy it? AKG N60NC headphone is ideal for your traveling needs. As it features the active noise cancellation, it helps to block the ambient sound in the most effective way. Not only noise canceling, it also features noise reduction. If you are traveling by plane, you will be able to hear the audio clearly. It will block the environment noises giving you a great music experience. Its perfect to tune in to all your traveling needs. You can also use the headphone while traveling in a car or even a train. It makes an ideal pair for your traveling needs. It’s also easy to carry along. Is it for gaming? Yes, you can use the headphone for gaming needs. The sound is clear and there is no distortion or leakage in the headphone. You can completely enjoy on track gaming with this headphone. Its also for music lovers, the sound is great for all the genres. If you love to enjoy your playlist on the go, then this headphone is indeed ideal for you. Though it’s not that great for your studio needs, still you can consider it if you need to work in a studio. It depends on the type of your work. You can also use the headphone for your desk job. There are many great features of Sennheiser PXC 550 headphone, let us look at some of the key features. AKG N60NC headphone features outstanding acoustic signature. The bass response will give you melodious enjoyment. It lets you enjoy every kind of music genre. The audio response of the headphone is amazing and good. 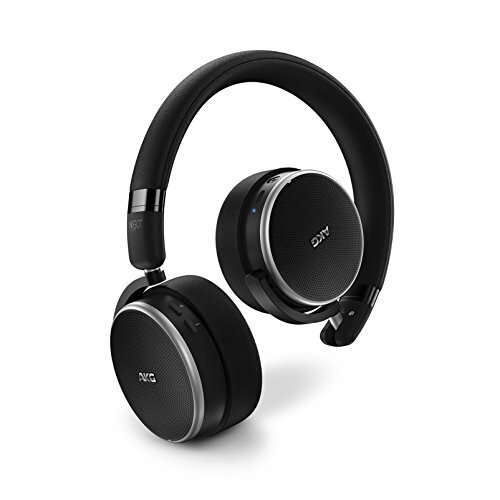 AKG N60NC headphone features active noise canceling and noise reduction technology. The feature reduces ambient noise, particularly when traveling to create ideal sound surroundings that will let you enjoy your music on the go. It’s great for your traveling needs. AKG N60NC headphone gives you a great listening pleasure. The headphone gives you 15 hours of music in Bluetooth and noise reduction. If the mode is off, it gives you 30 hours of listening in wired mode. This feature is with the noise reduction mode activated. The battery performance of the headphone is amazing for the price it offers. You can charge the headphone with a convenient USB charging cable that is available with the headphone. The headphone is stylish in looks. It is designed for suitable transport and storage. It features a 3D folding mechanism and an easy carrying case so that you can enjoy your music anywhere. It is indeed great for your traveling needs. The headphone is accented with the finest material such as memory foam and leather. This makes the headphone quite durable and sturdy. It also enhances the overall look of the headphone. It is elegantly crafted and it’s light in weight. Even if you wear the headphone for hours, you will not face the issue of clamping as such. There is no pressure on your ears. The battery can be recharged and replaced. AKG N60NC headphone features build in mic and remote. You can simply use this feature on the go. You can play your tracks at the touch of the button without manual selection. This also makes your music listening experience simply great. The headphone features wireless Bluetooth connectivity that is good. AKG N60NC headphone is light in weight and that makes it comfortable to wear for your long music sessions. The headphone features ear cups with a thicker padding and that does not cause any type of pressure on your ears. The fit of the headphone is also great and it does not clamp all along. In fact, it fits according to your head size. The size of the headphone is not so big and not too small so it is great in fit. There are different buttons in this wireless headphone that lets you operate your music with ease. It actually excels in this department. AKG N60NC headphone features active noise cancellation and active noise reduction. The noise cancellation feature of the headphone is good for traveling. It completely blocks the ambient sound giving you an amazing sound quality. It’s also perfect if you need some isolation or simply want to hear music all alone. The soundproof feature of this headphone is simply the best. The headphone also features noise reduction technology. It lets you reduce the sounds around with the touch of a button. This feature is good if you intend to enjoy your long playlist. Both the features work well with this wireless headphone. AKG N60NC headphone is made from finest quality leather but it also has a plastic body. This is the main drawback of the headphone as compared to other headphones that are available at this price. It’s sturdy and durable and you can use it for your daily use. The build is also good with mic and remote functionality. But, you need to adjust the headphone according to your convenience. You might feel uncomfortable if you wear the headphone at a stretch. The controls of the headphone are simple. You can control the headphone using a power slider. You can use a volume track button according to your comfort. The overall performance of AKG N60NC headphone in sound is good but not that great. You can get better headphones with good sound performance in this range. But, it’s good for the price it actually offers. The sound can leak or break in mid or low frequency. The range in higher frequency is quite good. In fact, with this, you can also enjoy different types of sounds and music genres. If you like bass, then this is a great choice for you. The isolation in the bass base is good and that is where it scores high. You may hear some echo with the closed back design of the headphone. The battery performance of AKG N60NC headphone is simply amazing. It gives you 15 hours of nonstop music with active noise cancellation and wireless feature. If you switch off the noise cancellation mode, it gives you up to 30 hours of backup. Even if the noise reduction feature is on, you can get a good battery life. The battery performance of the headphone excels and that makes this headphone an ideal choice for your traveling needs. The battery can be recharged with USB cable. The overall performance of the battery is simply amazing and this is actually an added advantage of this budget headphone. It features amazing noise cancellation. It’s quite sturdy and portable. The sound performance is average. It has an on-ear design. It’s not too great in comfort. Audio may suffer because of distortion. If you are looking to buy a good budget headphone, then this one will surely entice you. The headphone is good in overall style and design. Its compact and light in weight so its ideal for your long music playlist. The sound performance of the headphone is good but not that amazing if you compare it with other headphones in this price range. The headphone excels in battery performance, as the playback time is good. But, the battery also actively works with noise reduction feature. If you switch on the noise cancellation mode, then the battery may also suffer. The headphone is portable and it’s easy to carry along while traveling too. The Bluetooth connection of the headphone is also good and there is no such problem in connectivity. You can buy this headphone for a great price it offers with some amazing features. It is indeed a good headphone for your daily use. It is also good if you like to hear your music on the go. I am Justin Gorton, an Audio Enthusiast. I love adventure sports, reading & enjoy listening to any kind of soft music.